How often do you labor over your latest batch of homebrew? You carefully select which grains to use, lovingly add some exotic new adjuncts, and test out new hop varieties. There’s a bit of mad science going on, as well as art. Dressing up in a lab coat and playing opera music while lightning crashes in the background is optional, but we certainly understand the impulse. Yet, sometimes you may forget foreign invaders are everywhere, ready to take over your batch! While that probably sounds a little dramatic, molds, bacteria, and wild yeasts are lying in wait, and can easily spoil your hard work if you neglect to use a good brewing sanitizer. The best brewing sanitizers for your endeavors are powerful, easy to use, and help protect your beer from contamination, not to mention preserve their flavor. Otherwise, what is all that hard work for? While some folks use the terms interchangeably, cleaning is simply the removal of visible dirt, residue, and grime, while sanitizing is killing most of the bacteria, molds, yeasts, and other contaminants lurking in your equipment. Chemicals suitable for cleaning homebrewing equipment are often not adequate for sanitizing, and brewing sanitizers generally won’t do much to remove residue and grime. A mantra of many cooks, and with good reason, cleaning as you go reduces the amount of scrubbing and soaking you’ll have to do after you’re done. While brewing, mix your cleaning product of choice with some hot water in a bucket or sink, and toss in your brew kettle and other equipment to prevent dried-on, crusty messes. Also, if you get into the habit of rinsing bottles and carboys right after use, you’ll cut down on the number of cleaning products in your cupboard and make quick work of an otherwise time-intensive process. When dealing with hardened or burned-on residue, keep in mind that plastic, and even stainless steel, can scratch with heavy scrubbing. More scratches create more crevices for bacteria to live in, making cleaning and sanitizing harder than they have to be. Soaking can cut down on or eliminate the need to scrub, so use this tactic when possible. Household detergents might seem like an obvious choice, but they aren’t the best options for a variety of reasons. For one, detergents often contain perfumes that can linger on surfaces or be absorbed into plastic—even after rinsing. These residual perfumes can show up in your beer as unwanted flavors and scents. Pine-Sol-flavored lager? Um, no thanks. Even unscented detergents contain surfactants that can leave a film that’s difficult or impossible to rinse away and can ruin head retention in your beer. Phosphate-based detergents are marginally more effective than other types of detergents, but they’re also harder to find since they’re being phased out due to their negative effects on the environment. A better alternative, suitable for a variety of situations including heavy-duty cleaning, is a cleaner made specifically for homebrewing purposes, which is also safe for the environment. 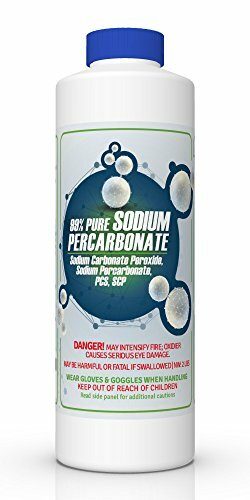 You can also use a sodium percarbonate cleaner, which is essentially a solid-form combination of sodium carbonate and hydrogen peroxide, with other additions depending on brand. These cleaners are very effective, easy to use, and environmentally friendly to boot. Once you’ve cleaned your equipment and bottles, you’ll be ready to sanitize. Remember: anything that touches the wort after boiling should be sanitized. This includes your fermenter and/or carboy, lid, airlock, rubber stopper, yeast starter jar, thermometer, funnel, and siphon. Your bottles will also need to be sanitized, come bottling day. The top three brewing sanitizers are all powerful options for killing contaminants. Each has its own merits and drawbacks, so choose the one that works best with your personal preferences and homebrewing style. 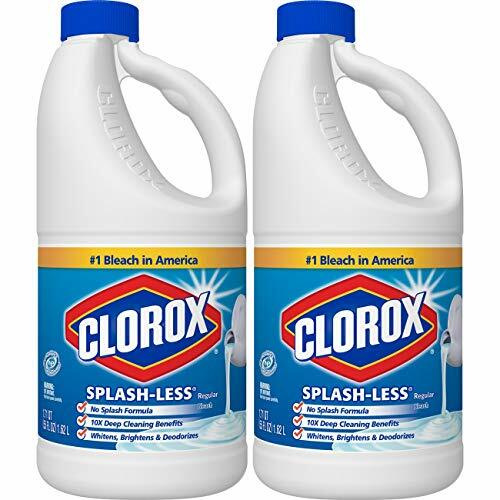 The most affordable of the three options, bleach is effective and as easy to find as a trip to your local grocery store. The active ingredient that works against bacteria is chlorine. When using bleach as a brewing sanitizer, be sure to rinse several times, or the bleach can react with compounds in your wort and affect the flavor of your beer. Plastic, in particular, tends to absorb bleach residue. Also, be aware bleach can corrode stainless steel if it’s left in contact for too long. Another consideration when using bleach as a brewing sanitizer is the potential for plain tap water to reintroduce contaminants during rinsing. You can certainly use bleach and rinse with plain tap water and have a successful brew, but to be absolutely safe, you’ll need to take extra precautions. One way around the problem of re-contaminating your equipment after sanitizing with bleach is to boil the rinse water before you use it. This creates more work and takes more time, but it reduces the risk of contamination. Another drawback is that to ensure the bleach residue is completely removed, you’ll need to rinse everything thoroughly, which means using a lot more water than other brewing sanitizers require. The typical recommended concentration is 1 tbsp of bleach per gallon of water. Soak items for 20 minutes, rinse several times, drain, and allow everything to air dry. Because it’s an iodine-based sanitizer, iodophor is approved for use in the restaurant and food service industries to sanitize surfaces that come into direct contact with food. It’s also inexpensive and requires no rinsing. But don’t worry, it won’t affect the taste or smell of your beer unless you use more than recommended. To use iodophor as your brewing sanitizer, combine ½ ounce with 5 gallons of water, which works out to about 12.5 parts per million (ppm). Soak your equipment in this solution for at least 60 seconds, then drain. Iodophor has a faint brown color and can stain plastic, especially if the concentration is too high. It performs best when used in cool—not hot—water. While more stable than chlorine, Iodophor will still degrade over time. It generally lasts about a week if stored in a glass or Polyethylene Terephthalate (PET) container. As it loses effectiveness, the color fades. Air, sunlight, proteins, and other chemicals such as chlorine can shorten the shelf life, so store it carefully to get the most for your money. 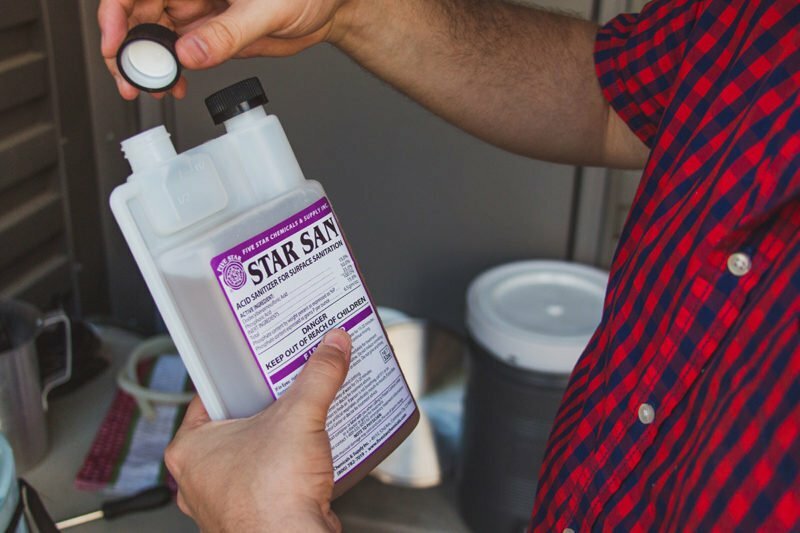 Well known throughout the homebrewing community—and our sanitizer of choice—Star San is a fast, effective, and easy-to-use brewing sanitizer. This acid-based product can be found at homebrew supply shops or online. 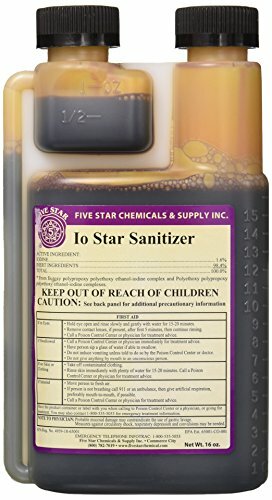 It’s a bit more expensive than other brewing sanitizers, but a little goes a long way. It requires no rinsing, and sanitizes after only 30 seconds of contact. It is also colorless and odorless, which is good news for you and your beer. 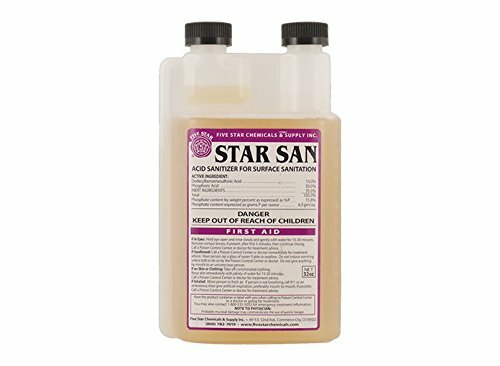 To mix up a batch, combine 1 fluid ounce of Star San with 5 gallons of water. You can get the mix exactly right by using the handy measuring cup on the top of the bottle. To prevent excessive foaming, add the Star San liquid to your water instead of adding the water to it in the bucket. The foam sanitizes just as well as the liquid and will not harm your beer, but it can just be a little unwieldy. You can make up a bucket in your fermenter and toss all of your equipment in to soak. If you use a glass carboy, clean and sanitize that, too. Just pour the liquid into the carboy and swirl it around for 30 seconds or so. No need to rinse. You can also put some solution in a spray bottle to give tools and equipment a quick spritz when you need to sanitize something on the fly. A solution of Star San will last several days if kept in a closed container. Once the pH rises over 3, however, the solution is no longer effective and will turn cloudy. To improve shelf life, you can mix it with distilled water. Making distilled water part of your process may be worth a tiny bit of extra hassle to extend the usability of an already convenient brewing sanitizer. While cleaning and sanitizing is critical to ensuring your frosty brew is as delicious as you imagined it would be, it doesn’t have to be difficult or stressful. Eliminate the need for an arsenal of products, and choose a few quality cleansers and brewing sanitizers that are effective while streamlining a boring but necessary part of your homebrewing adventure.